A dictionary is a special book with which you can discover new words and understand the meaning of words you’ve come across recently. The book may have a large number of words and their definitions. The problem with the traditional dictionary is that the user must spend some time in locating the word. If a dictionary has 100s of pages, identifying the meaning of the word will be a frustrating experience for the user. The best and quickest way to find the synonym of words is to use a good dictionary app on a mobile device. The applications use a fast searching algorithm to get the meaning of words from a database table. They are lightweight and free. 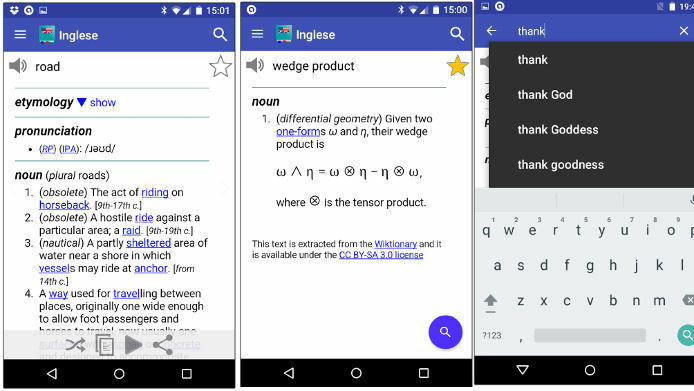 Below, we’ve shared the best Android dictionary applications which you can use on phone or tablet. The Oxford dictionary retails for $2 in offline bookstores. If you don’t want to spend money or waste time in looking up words, download the free version of the Oxford dictionary app from the Google Play Store. Oxford is a popular dictionary app. It is easy to use. 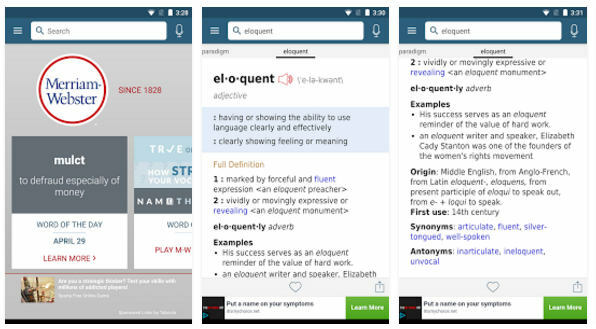 When you run Oxford dictionary on your Android device, you’ll see a large popup box that displays the details on the premium version of the Oxford app. To close the popup, tap the back button of your mobile phone. The main interface of this application includes a search box where you must enter the word. Below the box, the app displays a list of words. The list is accompanied by a vertical scroll bar and it contains over 300K words. When you enter a letter in the box, the app will display the words beginning with the entered letter. Oxford dictionary supports voice input. It makes users aware of the words they’ve searched recently. It has the word of the day feature which displays new random word and its definition every day. The size of the Oxford dictionary app is 15 megabytes. 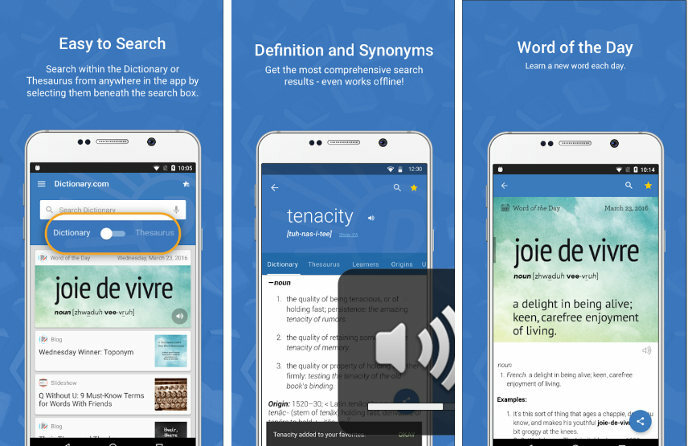 Dictionary.com is one of the most popular dictionary apps for Android. It gives users access to 2+ million words and their meaning. Like other Android dictionary apps mentioned on this list, this application provides a search utility. Beneath the search box, you’ll find a toggle button to filter the search results. The app features a list of the most searched words. It has a translator tool through which you can translate words into 30 languages. It also includes a word pronouncer utility. The app shares tips on improving writing skills and vocabulary. Dictionary.com provides a voice search function. It lets users go through the official Dictionary.com blog where English language experts share their tips on improving grammar, vocabulary, etc. According to its developers, MW is the most respected dictionary app in the United States. The app includes quiz tests that help users in building vocabulary and learning new words. MW dictionary can pronounce words for you. It has quick definitions utility which displays the definitions of words on the fly. The application maintains a list of words you’ve searched recently. It features a favorites section where you’ll find a list of the words you’re searching often. The free Merriam-Webster dictionary app for Android provides examples of how words are used in sentences. 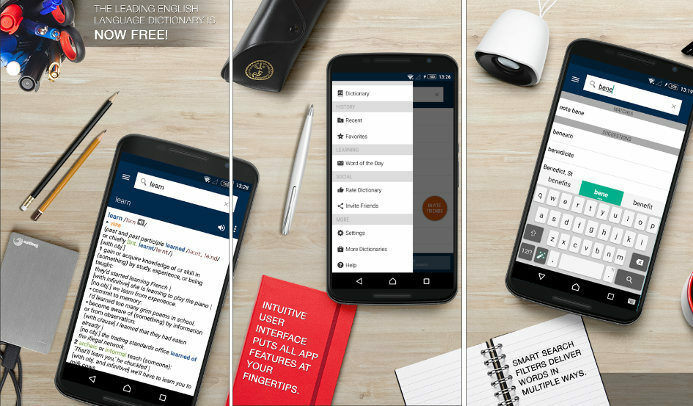 If you’re searching for an offline dictionary app for your Android device, download and install OED. This application has a simple interface. As it doesn’t require internet connectivity to work, OED is an ad-free application. Text font size, UI color. The settings interface allows users to turn on/off the voice to text feature. It enables you to define a shake action. Hindi is a widely spoken language. If you’re traveling to India, install this dictionary app to understand the language spoken by the locals. The free Hinkhoj app supports Hindi swear words. The great thing about this app is that it understands Hindi words typed in English. It also makes you aware of the word’s meaning. Apart from providing definitions, the app suggests the words that sound similar to the entered words. The app also shares its antonyms. 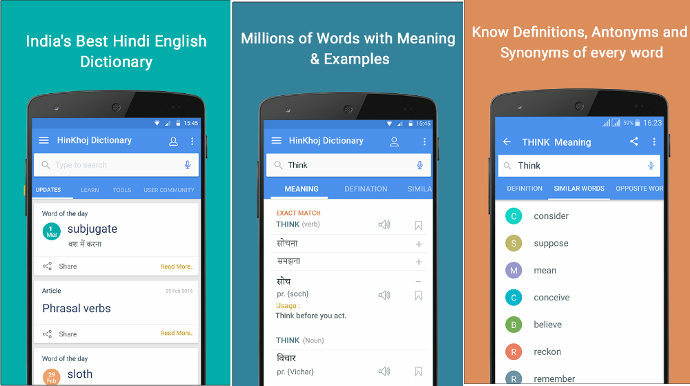 HinKhoj helps users in improving their vocabulary. It has three games which will help you in discovering new words. Hinkhoj ships with a word pronouncer tool. It provides a spelling checker utility. It includes an inbuilt OCR tool that recognizes the words printed on images. Conclusion: If you’ve a bad vocabulary or you’re trying to learn English, install any one the above dictionary apps on your Android device. The applications are intuitive. You don’t have to register an account or pay money to use them.